This is one of the major projects I´ve been working on this winter. I did use some more specialized metal tools for the process so I hope it doesn´t spoil the primitive character of this website ;-). I decided to write about the process in a how-to format, with some of my own experiences and observations added in italics. 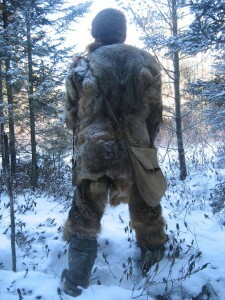 Toboggans and snowshoes were the major form of winter transportation for the Ojibway, the Native people of the Great Lakes area. Toboggans tend to be fairly narrow (one foot or less in width, about 30cm) so they follow well in a snowshoe trail and have an upturned front so that they don´t dig into the snow. The first step consists in selecting the right wood – it needs to be strong, flexible and preferably also light. 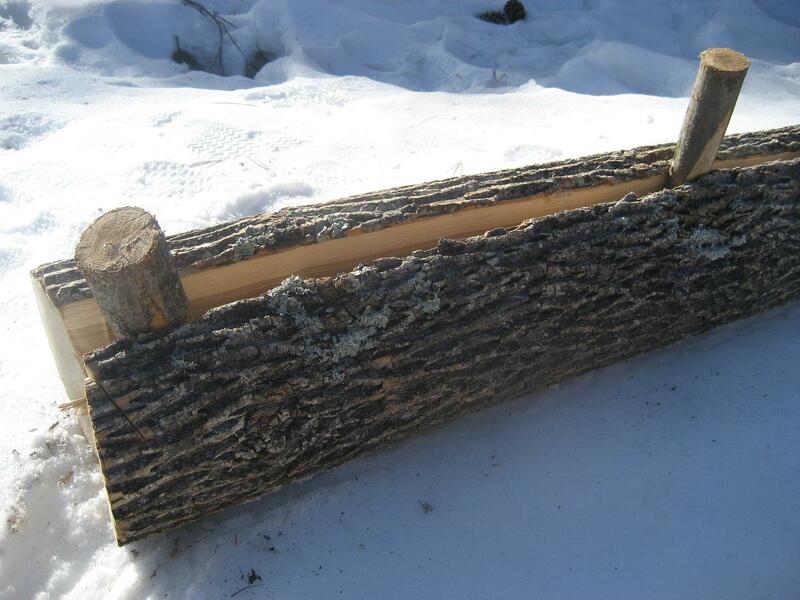 One of the best species for that purpose that grows in the Northwoods is white ash (shown in the picture above), which is the wood I´ve used for my toboggan. 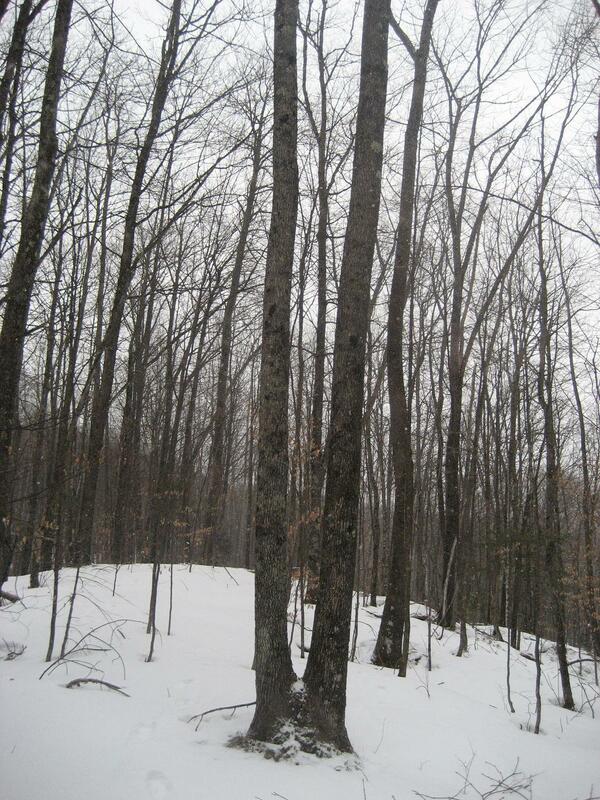 Selecting the right tree is another important decision: The wood should be as straight-grained and knot-free as possible. Any knots are a potential weak spot and are difficult to flatten out. Wood splits along the path of least resistance, and if the grain is twisted the split will follow those curves. The two-plank toboggan is the most common style and the one which I will describe here, although it is also possible to just use one very large board or more than two planks (the latter tends to make it less stable though). The tree size needs to match accordingly – if a one foot wide toboggan is desired, it follows that each of the two planks has to be at least 6 inches wide, so the trunk of the cut tree will most likely be somewhat bigger. The tools I used for the process are as follows: A heavy axe and saw for cutting down the tree and splitting the log sections, a hewing axe and a drawknife for thinning down the planks and a knife. For the steaming process I used a large metal pot. 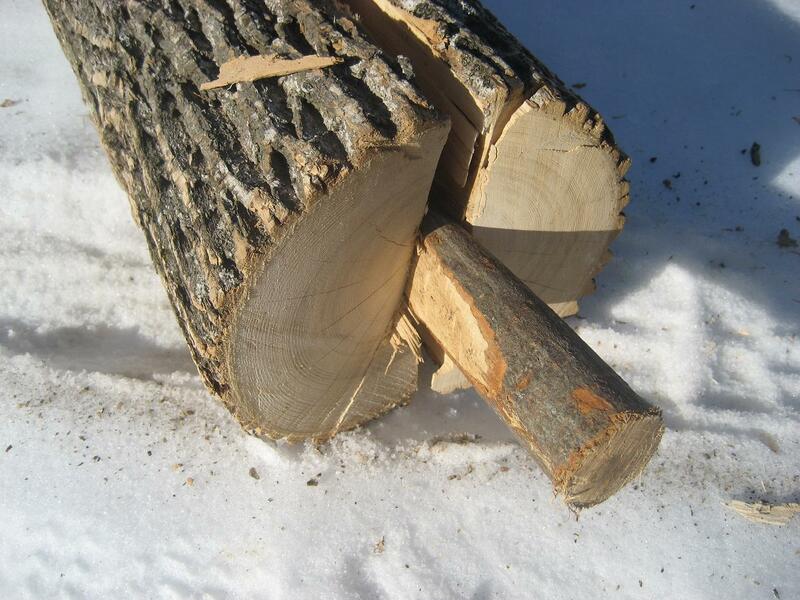 Once the tree is felled and cut into smaller sections, the log needs to be split in half. An axe can be used to form the initial split through the center on one end of the tree and then a wedge gets inserted to widen the crack. Wedges are easily made from the side branches of the felled tree. 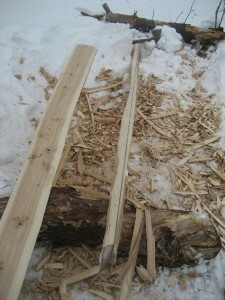 As the crack progresses in length, additional wedges can be inserted and then pounded in with a mallet or the back of an axe. It is recommendable to do this on both sides simultaneously so that there is less of a chance for the crack running off to one side. Sometimes you learn those lessons the hard way: When I got to the center part of the log, the split ran off to the side and both split pieces ended up not being useable for a toboggan since they were too short. Fortunately I still had a few more log sections. By adjusting where and at which angle the wedges are placed one can somewhat change the direction of the crack, but as mentioned before, the crack tends to follow the path of least resistance – along the grain. Even under ideal conditions the split will probably not be totally straight and flat, so the next task is to figure out where to get a flat side while using the maximum width available in the log (as close to the center/split as possible). The plank to the right in the picture above has a string running along its length to mark a straight line which will be used to form one of the flat sides of the toboggan. A hewing axe is ideal for the rough work, and a drawknife helps to get the surface more flat and smooth. Once a flat side is established (left board in the picture), the thickness of the planks can be marked by running a line parallel to the flat side. Now the planks are ready to be thinned down. It is advisable to proceed in small step, i.e. not go to the final thickness right away in case a cut goes a little too deep or an adjustment needs to be made. I decided to first work the plank down to a thickness of ½ inch (about 6mm), with the final thickness being ¼ inch. White ash is plenty strong and I figured that a board on the thin side would be easier to steam-bend while also being lighter. 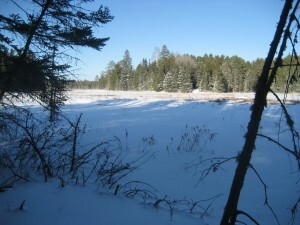 Many toboggans are in the thickness range of ¼ – 3/8 inches. Once the planks are thin and smooth they need to be laid next to each other to determine the sides which will adjoin. Some trimming may be necessary in order for the planks to fit together without major gaps in between. Crosspieces will ultimately hold the two planks together, and marking where they will go on the toboggan is the next step. I recommend having a crosspiece every foot or less along the length of the toboggan. A smaller log section can be used to split out the rough crosspieces, which then get carved and fitted with holes and a notch at each end (on the underside as shown on the picture above – this is where the gear lashing cord will run through). 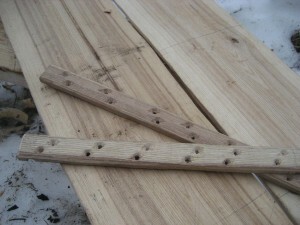 The holes on the toboggan planks need to be lined up with the ones on the crosspieces. I used 10 crosspieces for my toboggan, and each crosspiece had 12 holes placed in a diagonal pattern. After all the crosspieces were done, I laid them on the boards and poked through the individual holes with an awl so that the holes on the planks would be marked in the same spot. 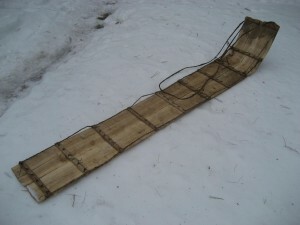 The traditional toboggan style has a fairly strong bend in the front to prevent it from digging into the snow. There are several ways to achieve that bend, with steam-bending being the most common used nowadays. Under more primitive circumstances, the most effective method is to pre-soak the planks in water and then boil them (at least the section that receives the bend). 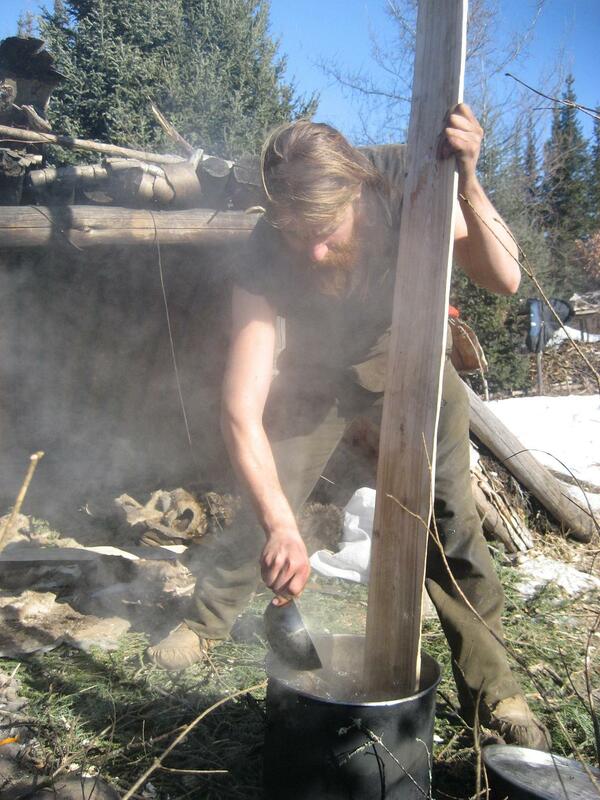 The time required for sufficient boiling depends on the thickness of the planks, how dry they were to begin with and how long they were soaked before. A cooking vessel could be e.g. 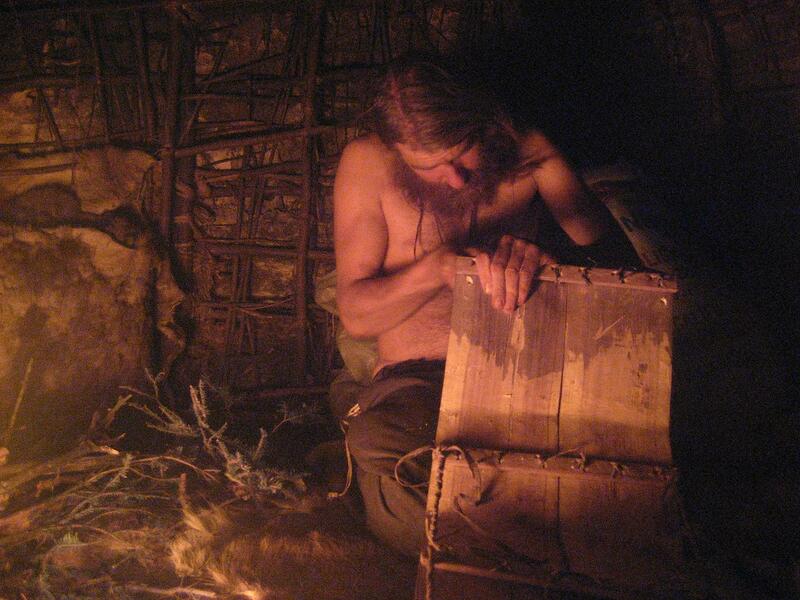 a hollowed out log or a dugout canoe filled with water which gets heated up with hot rocks. For boiling the planks, I used a large steel pot. The bottom got immersed in hot water, but the area where the bend was going to be was too high up to be submerged so I poured hot water over the spot for a few minutes. When the planks are hot and thoroughly saturated with water they can be bent around a rounded stationary pole or log. With the front pinched between a couple logs, one can get quite a bit of leverage by working from the back of the plank. I suggest to initially be careful with the bending to get a feel for how much force needs to be used. If it seems hard to achieve any bend, the planks might not be saturated enough with water and/or not hot enough – more boiling/heating may be required. Apparently in my case the steaming process wasn´t thorough enough so the plank started bending mostly in a weak spot with a branch hole. I therefore decided to concentrate the bend on two spots on the planks and work with less of a curve than some of the old-style toboggans. Rawhide lashing is used to secure the crosspieces on the planks (a set of two diagonally placed holes gets tied with a short piece of rawhide). 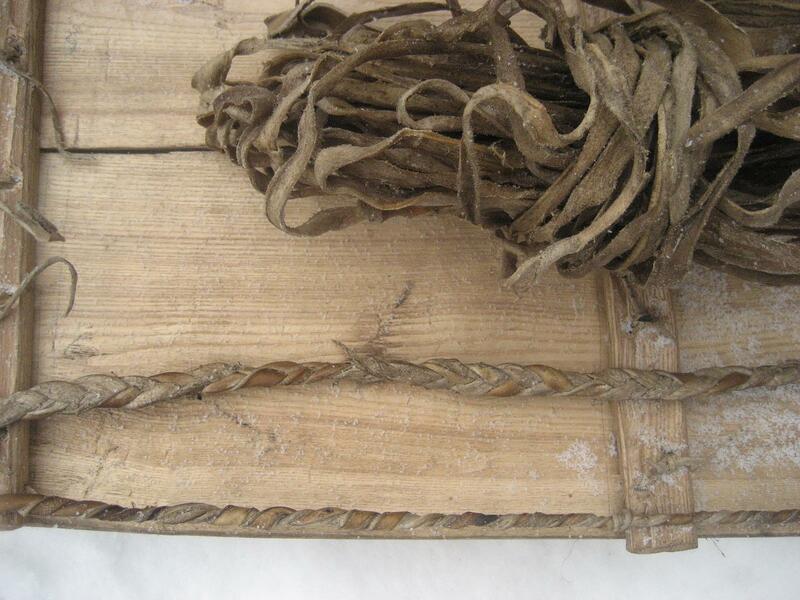 The pulling cord is also made of rawhide – a braided rope works pretty well since it´s quite flexible. The final works were done by the firelight inside of a wigwam. I thinned down the tip of the rawhide lashing to fit it through the holes; sometimes a needle was also helpful in that process. Details of the rawhide lashing. 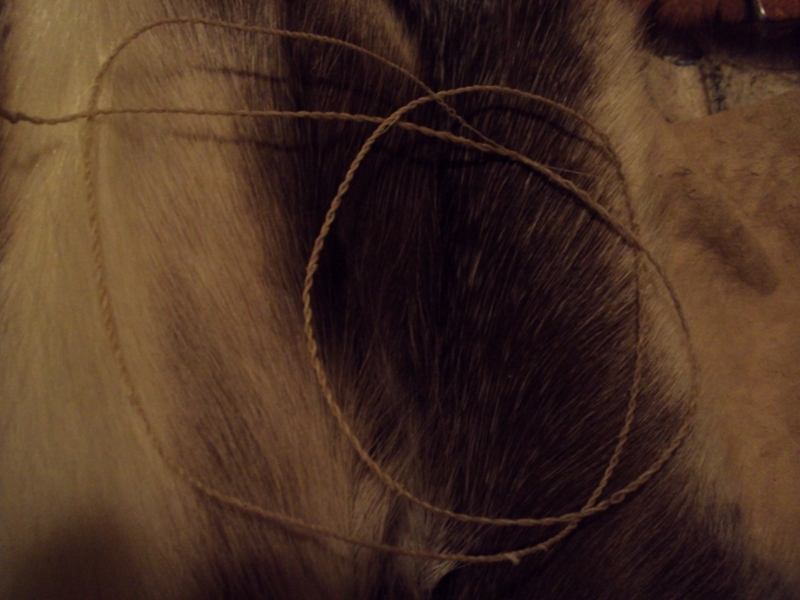 From top to bottom: A bundle of dried rawhide, braided 3-ply rawhide string for the pulling cord, and reverse wrapped rawhide that runs along the sides of the toboggan (gear lashing cord). 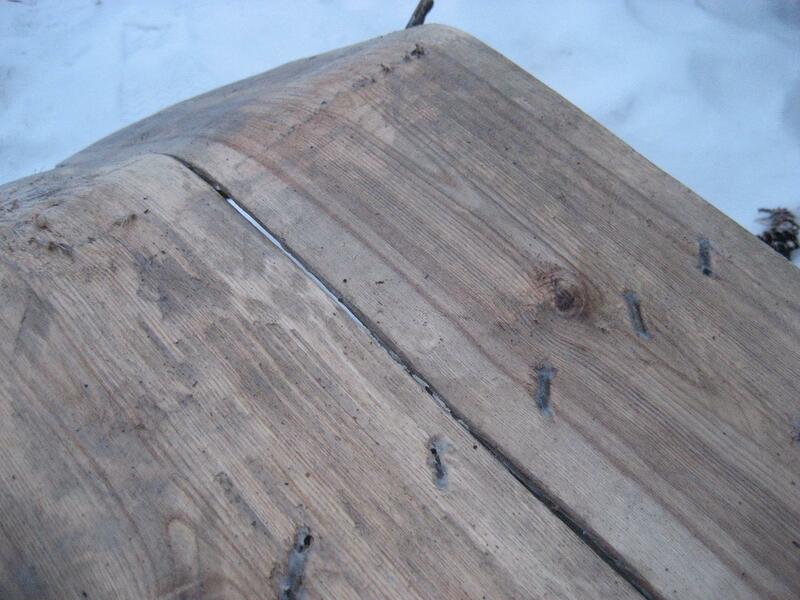 Greasing the underside of the toboggan helps to protect it from moisture, especially in wet snow. For this I chose a fat with a high melting temperature (tallow) since it forms a coat that allows the toboggan to glide over snow and ice. 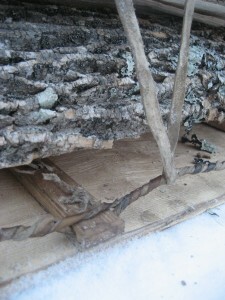 The picture also shows how the rawhide lashing for the crosspieces is sunken into the boards in order to avoid abrasion. Also visible is the radical bend in one part of the upturned front. The finished toboggan is 7feet 6 inches long (about 2.3 meters) and between 13in (33cm) in the front and 11.5in (29cm) in the most narrow spot towards the back (the planks aren´t totally rectangular). Also visible is the gear lashing cord to the sides and the pulling cord in the front. As you may see in the picture, the bend in the front isn´t equally distributed – it is concentrated in two spots (which makes it somewhat weaker than a nicely bent arch). 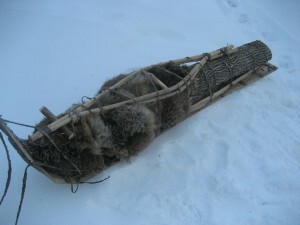 Toboggan with gear lashed on. 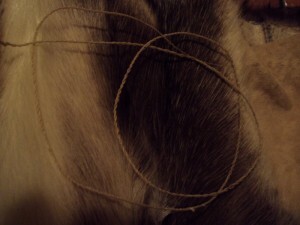 Simple rawhide lashing is tied across the load and lashed to the gear lashing cords to the sides. The planks turned out to be slightly thicker in the center than on the sides which meant that the crosspieces weren´t flush with the boards. I therefore wrapped the gear lashing cord around the crosspieces instead of just fitting it underneath the notch. It´s been a rewarding process for me. 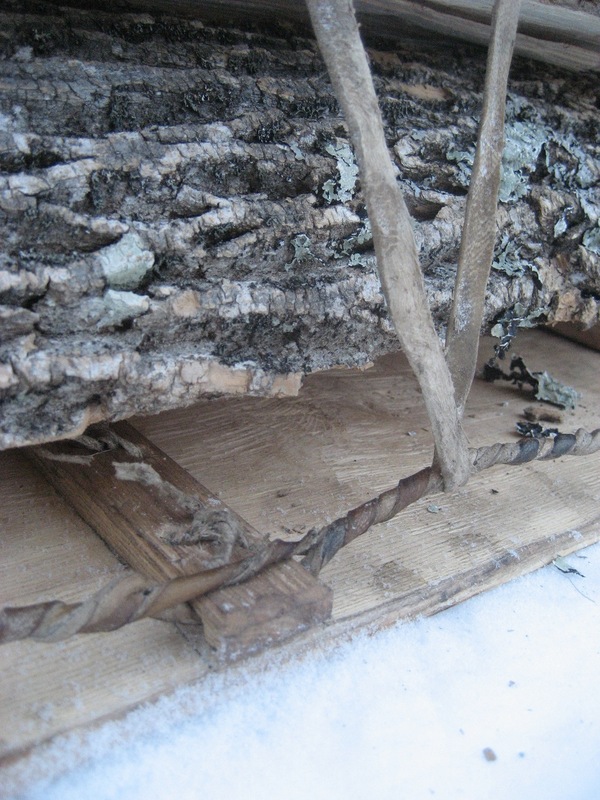 The resulting toboggan may not be a work of art, but it´s pretty sturdy and functional. Specialized metal tools like a hewing axe and a drawknife make the process much faster and easier than working with basic tools such as axe and knife. With stone tools only this would be an even more daunting project, and probably only realistic if a wood is chosen that´s easy to work with stone tools (such as Atlantic White Cedar, since it splits easily and therefore reduces the amount of wood that needs to be removed). 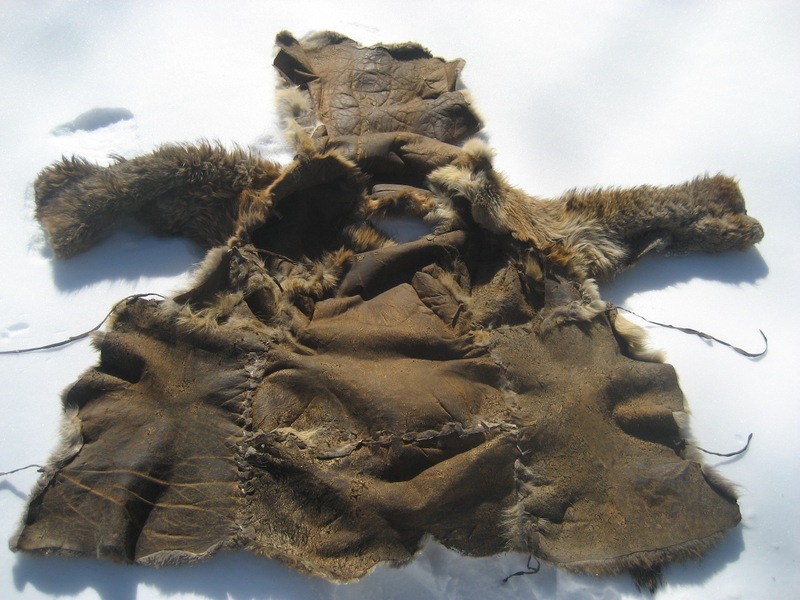 The research I´ve done and my own experience tell me that most northern Natives probably used hide sleds/toboggans before metal tools were available to them. I may work on a simple hide sled in the near future and post about it here. Drilling the holes to lash on the crosspieces with a knife took up a lot more time than I originally thought. I experimented with drilling holes with a thin bow drill set which is even more time-consuming (white ash is a pretty hard and dense wood). 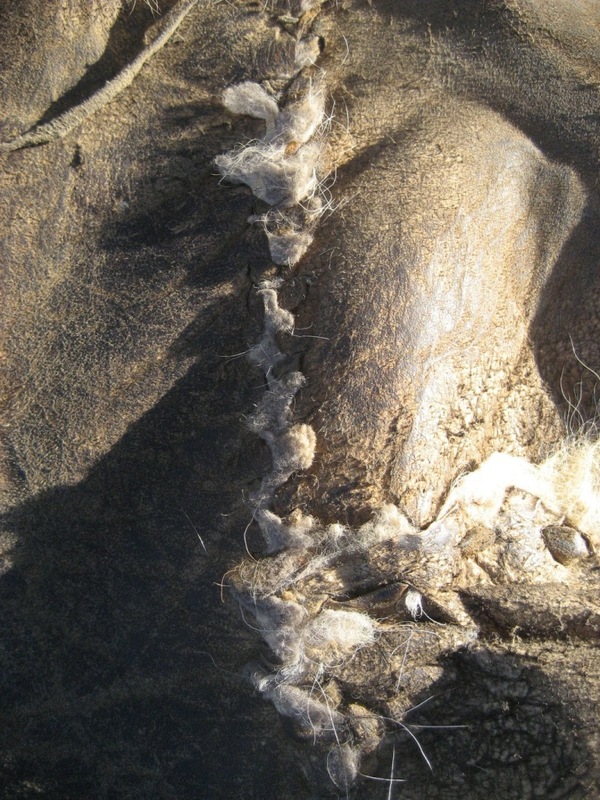 Reducing the amount of holes may help here – by using less crosspieces or notching the crosspieces so the rawhide can go around them rather than through holes. 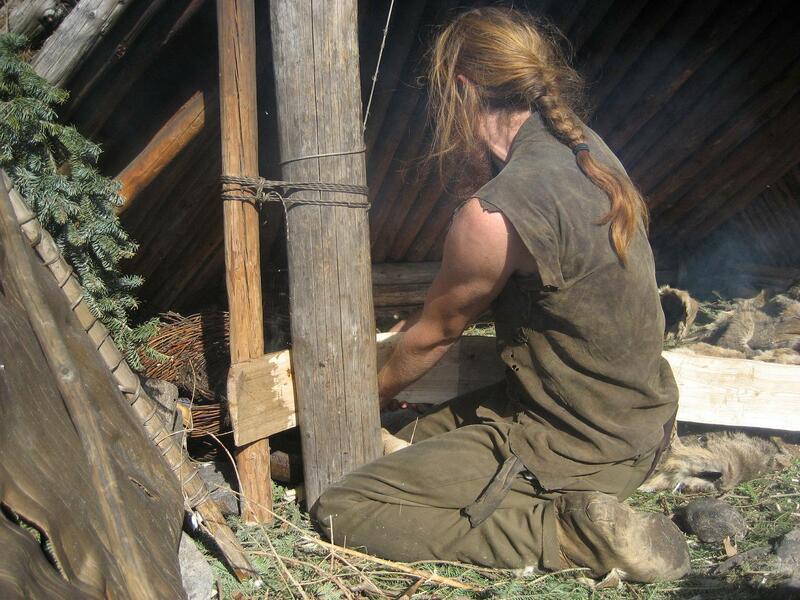 If other people have worked with making toboggans or similar crafts with hand tools, I´d be happy to hear about your experiences and suggestions! Also, I´m trying to improve this tutorial so it may be easier to understand for someone who´s fairly new to this…any comments and suggestions are welcome. Many of the details of the toboggan have been inspired by Jarrod Stone-Dahl, a talented craftsman from northern Wisconsin. You can check out his website here. 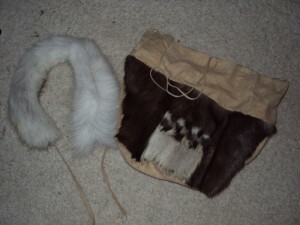 A pair of winter mukluks that I finished earlier this winter. 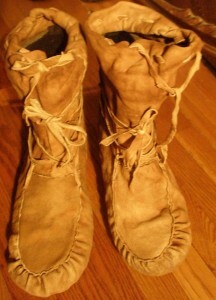 This is the “puckered-toe” style that Natives in this area typically used. Two long lacings on each mukluk can be wrapped around several times and tied off to secure it to the foot. 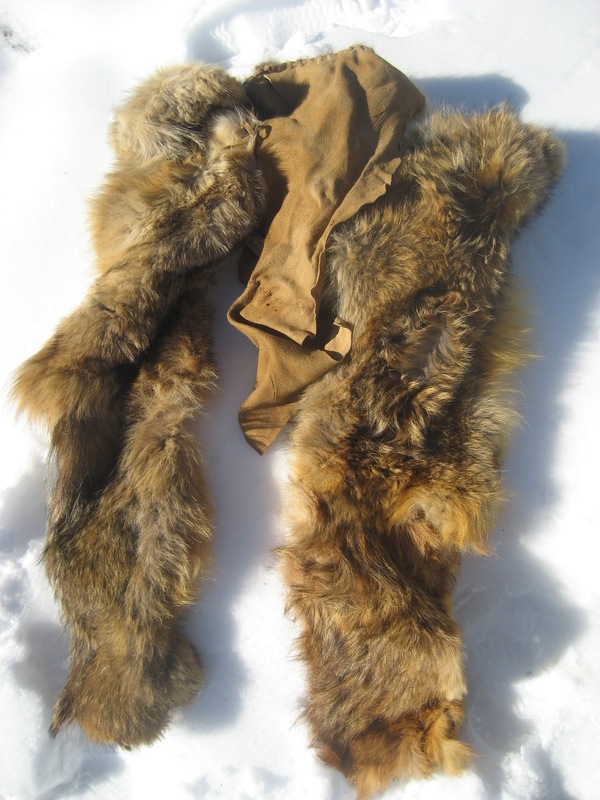 A drawstring on the top prevents snow or debris from falling in (which usually is not a problem since the upper part of the mukluk is overlapped by pants or leggins anyways). 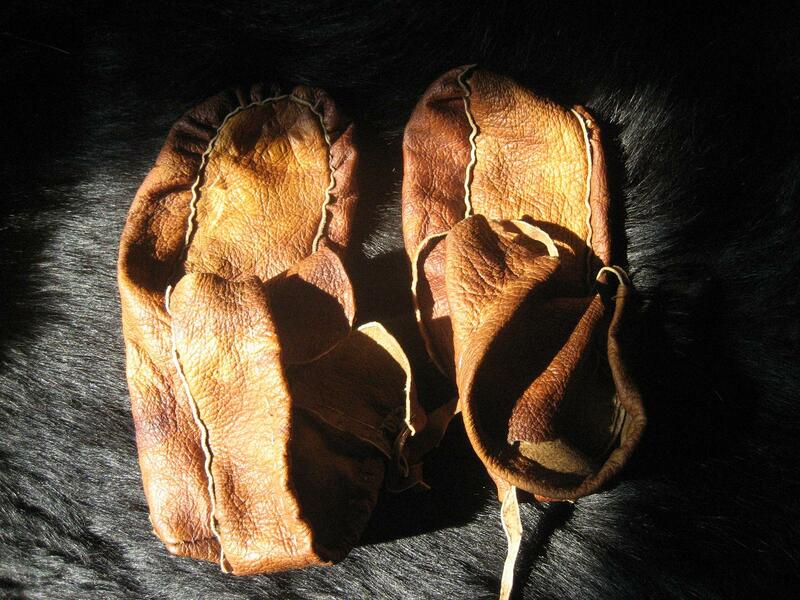 The material is buckskin (grain off); I placed the sole in the thicker area of the hide, for the uppers a thinner piece is sufficient. For the sewing I used artificial sinew. 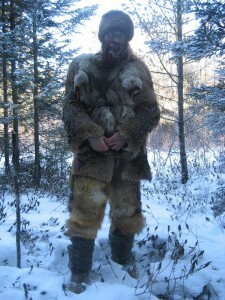 The same mukluks after a winter of heavy use. They´re still in very good shape, and besides reenforcing some of the stiches (after the buckskins streched some of the seams were not completely tight anymore) no repairs were necessary. Winter conditions are usually more gentle on footwear, and so a pair can last for a while. This style of mukluks is mainly suited for cold temperatures – once the snow gets wet, the mukluks and eventually the stockings and feet will get wet, too. One of the (many) projects I´d like to work on is to make some more water-resistant boots e.g. made with beaver fur. If it happens I´ll post about it here. 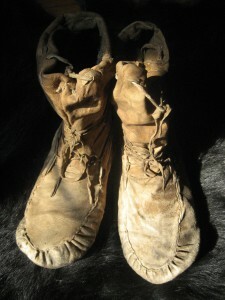 A pair of summer moccasins made from grain-on buckskin that´s been treated with pitch and oil. To increase their durability, I´ll probably sew on one or two more soles of buckskin to the bottom. 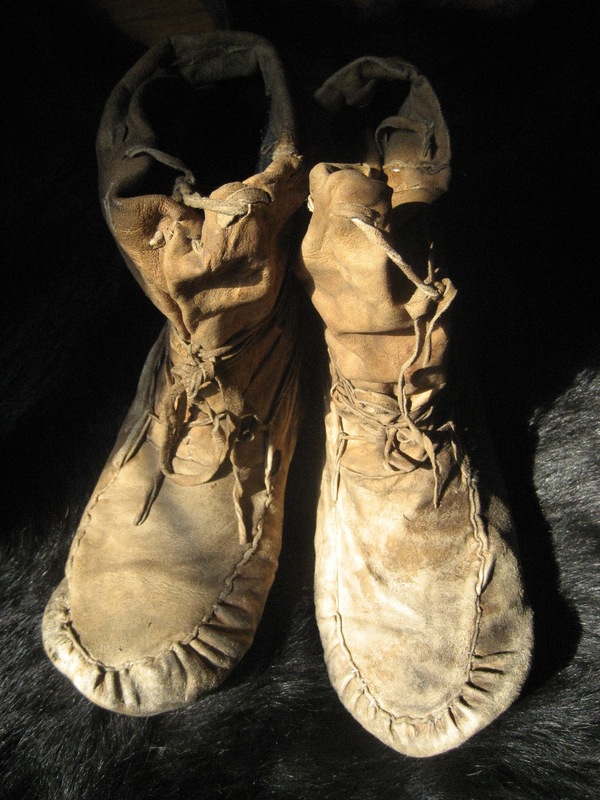 Soft grass stuffed inside provides some extra comfort and insulation, especially when the moccasins get soaked in wet conditions. A while ago, when I came to the city again to look for work, my modern jacket had this horrible draft down the neck, one of the worst places. 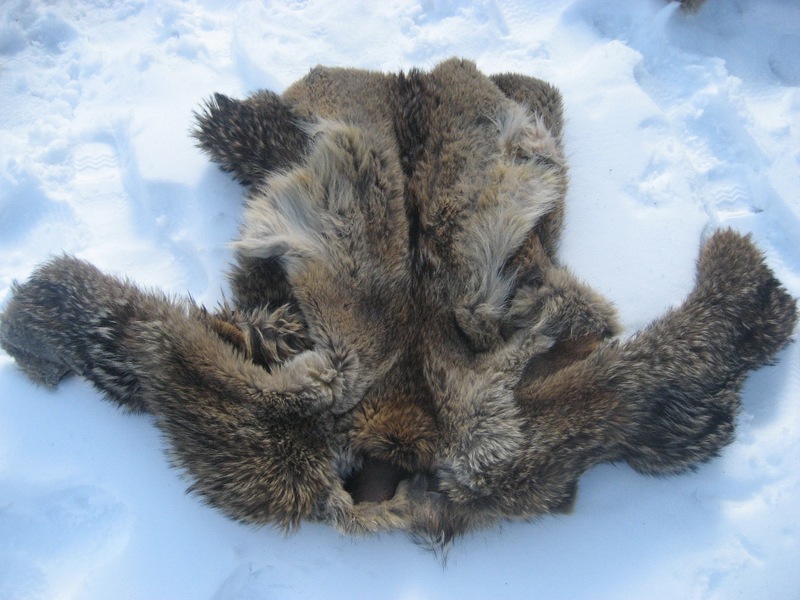 To remedy this, I made a fur collar out of some leftover belly fur from reindeer. Works marvelously and easily gets too warm. From last year’s making of clothing I still have a lot of leftovers. I wanted to try to reduce that pile while making something useful out of it. The bag is made out of exactly 50 individual pieces. All of this sewing takes considerable amounts of thread and I ran out of good length sinew as I was working. This happens occasionally and I then twine longer two ply string out of the shorter pieces of sinew. Normally I just roll a bundle of long strands to one single ply string. When making the string I gently wet the strand(s) with saliva to make it loose it’s memory. And then I let it dry for a few minutes before using the thread. Otherwise it will usually split and break during sewing. The plan was originally to use this bag as a first aid kit, but I think I’ll use it as a bag for tucking away sewing projects in progress.